The blue suit is an essential addition to your wardrobe: a timeless that never goes out of style. 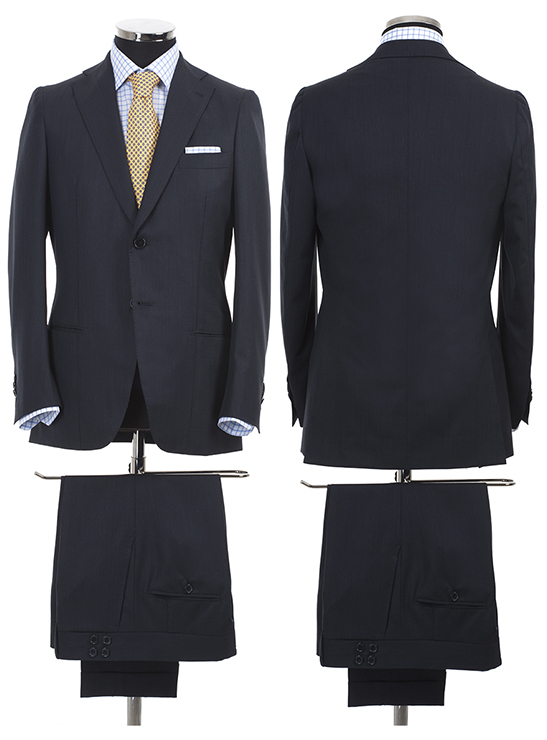 This blue suit is realized in esteemed wool. The jacket is a 2-button classic, with flap pockets and side vents but a sober lapel and the armhole “a camicia”. The pants are an unusual solution: two welt pockets on the back, extended high 2 button-belt, classical pockets. To match the outfit, a shirt with embroidered letters, made in 100% cotton and windowpane pattern. Following the RICERCATO style, we realized both a pocket square in the same fabric as the shirt and an alter ego exclusively by poschette. Jacket: 100% wool, 2 buttons. Pants: 100% wool, high 2-button-belt, classical pockets. Shirt: 100% shirt, classical cut, no pocket.